There are almost as many variations on Mah Jong sets as there are grains of sand or stars in the sky. Well, not really that many, but unlike other games where the boards and pieces stay about the same (such as a chessboard), Mah Jong has many different variations of design and look. Mah Jong sets are often contained in a case. This makes it easy to store all the different pieces of the Mah Jong set, such as the tiles and the dice and sometimes even chips. Modern Mah Jong sets are often composed of plastic or resin pieces which have their markings cut or stamped into them. Finally coloured paint is added to embellish. 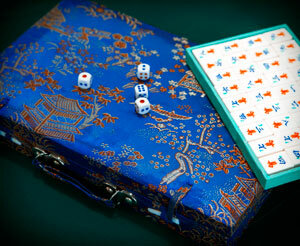 Some Mah Jong sets are very elaborate, and are composed of beautiful and precious materials. There are sets made from fine woods, with the tiles delicately hand-carved. Often there are different kinds and colours of wood that are used to give a different feel to the set. There are some sets that use ivory tiles, although since ivory has been outlawed in many countries this is very rare to be found. The colour of the ivory tiles is off white, and not a bright white. Some other old sets were comprised of bone, bamboo, or even cardboard. 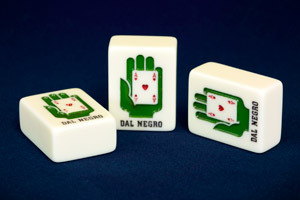 There is an assumption that the plastic tiles used in Mah Jong are often made up of a plastic substance called Bakelite. Actually, they are usually made up of a different plastic called Catalin, which is also a type of plastic. That is not to say that no sets were made with Bakelite, as some of them have been made with that type of plastic. There are also sets with tiles that have a frame built around them, almost like a small picture in a frame. The tiles themselves vary in size from game set to game set. Sometimes they are quite large, but especially in some of the older versions the tiles are quite small. They usually range in height from one inch to about one and one half inch. Some game sets have expensive inlays of mother of pearl, for example. There are some cases where rare or semi-precious stones are used in the design. Often, it is the cases themselves that are sometimes more expensive than the pieces inside. Some people take great pride in their Mah Jong sets and have carrying cases that are tooled in fine leather with excellent workmanship. There is record of the world's most expensive Mah Jong set. Supposedly it is being worked on by a Dutch silversmith by the name of Janny Schoonhoven. It is said to be prices at between 35,000 to 40,000 Euros, or approximately $50,000 USD. The tiles are made completely of silver – ten kilos worth, actually – and each tile individually has taken the maker eight hours to make. There are also different kinds of Mah Jong sets depending on if you want to use the original Chinese characters or if you want Arabic numerals such as is more familiar to Americans when they are playing. Often there are different birds represented in different sets. For example, some sets use cranes as one of the birds. Some sets also have what is called a wind indicator and counting sticks. Some have markers in them. There are others that have different variations of all the tiles with some slight differences. Some have slightly different dragons, for example. Some of them have jokers while others do not.